Star Light Zone is a rather peaceful zone set in an urban environment at night, under the stars, and contains many loops (claimed in the UK Sonic the Comic series and a few unofficial American works to be 'unfinished highways'). There aren't many enemies here, or at least not many which can be destroyed by Sonic. The most prominent of these foes are smart walking bombs — these walk along the floor or ceiling, and will explode a few seconds after Sonic approaches them. A play mechanic introduced in this level (never to be used again) was that of dropping staircases — some 'staircase' blocks can be hit from below, causing them to wobble and fall into a new position. This opens up a new route through the level. The greatest hazard in this level are giant drops into which Sonic can fall to his death. 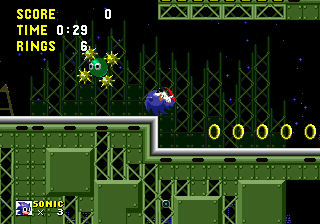 Fans which prevent you from moving (reappearing in Sonic 2's Oil Ocean Zone), flame-shooting vents and see-saws hanging in thin air make navigation harder. It seems that they tried to raise the difficulty of the stage by removing the checkpoints in this stage. There is only one post in the entire zone, directly before Robotnik, but most people never notice this due to the zone's simplicity. Ironically, since there are no rings after it, hitting it might not even be a good idea if you find the boss difficult. Bomb — Mindless kamikaze bomb bots that walk back and forth along a short plane, either on the ground or ceiling. Orbinaut (Uni-uni) — These guys, palette aside, look exactly like the Unidus variety. They're a bit more cool-headed, though, and won't fire off their shield of mines. This page was last edited on 8 April 2018, at 09:44.